Freshmen Alex Miera stands in front of her winning Instagram photo, which has been turned into a poster to be hung in the new school. 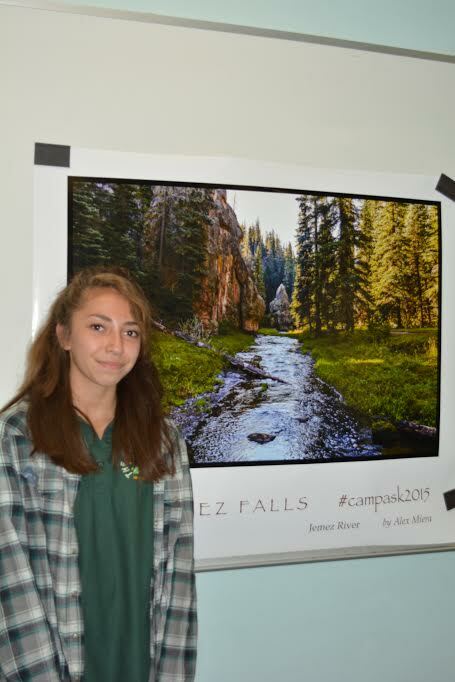 Freshman Alexandria Miera is the 2015 winner of the Instagram photography contest from the Jemez Mountain camping trip. Pictures were posted to Instagram and tracked with a hashtag, then voted for with a ‘like’ to the picture. The Catalyst staff then voted from the top ten posts with the most ‘likes’ and a winner was chosen. There were 93 photos entered from scholars in the contest, and Miera’s won with 53 ‘likes.’ All photos can be found under the hashtag #campask2015. She goes on to explain her Instagram caption, “Chased by Cow.” She said while on her hike near that river, she attempted to photograph the cows in the area, and one advanced quickly at her, just before she took the winning photograph. Miera gets to take home a poster of her photo, while another poster will be framed and hung in the new school. Middle school Project Manager Shelly Bethke and her husband Rick Schneider graciously edited and printed out the posters to both Miera and the Academy. Though she has never taken a photography class, and doesn’t know if she ever will, she thinks she will continue the hobby for awhile. “Even pro photographers for National Geographic are still learning things; there is no limit to the amount you can learn when it comes to photography,” she said. Click here to see last year’s winner. ← Photo of the Week: What’s Bubblin’ in DeGroot’s Class?